Tops Solid Surface brings value, efficiency and personal style to your kitchen remodel. Whether your renovated kitchen will be the hub of your busy home, a gourmet chef's haven, or a cozy spot to gather family and friends, Tops is here to help you put all the pieces together. Our Design Center is the best in the South Sound area, featuring thousands of materials for you to mix and match, and design examples to help you envision your kitchen remodel or renovation. You'll find a huge selection of kitchen remodeling choices including eco-friendly locally-harvested wood; beautiful stone including marble, granite, and soapstone; tile in every shape, size, texture and color; and so much more! Tops staff designers stay informed of new products, materials, styles and trends, and are happy to work with your budget and time considerations. 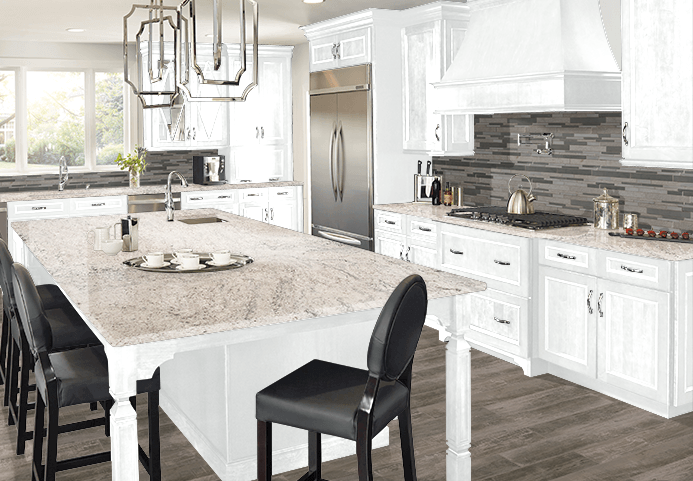 Call Tops today for your free kitchen design appointment at 360 459-3000, or stop in during our Design Center hours. NEW! Design with our virtual Online Kitchen Design tool! Mixing and matching textures, colors and surfaces can be confusing. Our Design Center is a great way to see and feel thousands of options. But if you can't stop by, try our new online Virtual Kitchen Design tool! View the Tops Kitchen Gallery for design inspiration. In over 20 years of serving Olympia and the South Sound, we've brought thousands of beautiful kitchens to life, balancing classic styles and modern trends. Click to view some of our favorites! Let Tops designers show you simple and affordable kitchen remodeling as easy as 1-2-3! Our design staff will help you make selections for a kitchen that you'll look forward to enjoying for years to come! We'll begin with learning how you envision your kitchen, and then help your find countertops, backsplash and fixtures in our fully equipped Design Center, or with a free home kitchen design consultation. Call Tops today for your free kitchen design appointment, or stop in during our Design Center hours.